Casual holiday entertaining island style. Casual serveware for stylish entertaining. Casual serveware is perfect for outdoor parties poolside, on the beach, the backyard or sun porch. Terradura clay bowl with hippo silhouette base. Hand-dipped in glaze. Designed and manufactured by Rialheim in South Africa. An expression of our culture and emotions through craftsmanship and design. Terradura clay bowl with double rhino base. Hand-dipped in glaze finish. Designed and manufactured by Rialheim in South Africa. An expression of our culture and emotions through craftsmanship and design. Hand-painted salad plates. Crafted of terra bianca. Set of four. Made in Italy. Hand-painted zebra platter. Made of terra bianca. Made in Italy. Hand-painted cheetah platter. Made of terra bianca. Made in Italy. Add a touch of whimsy to your next gathering with these serving plates handmade by artisans in Kenya. They also wow at wedding events and receptions. Each piece is made from wild olive wood, known for its striking grain patterns and durability. Making the most of the natural beauty of petrified wood, Janice Minor creates serving pieces that prove the strength of simplicity. The petrified wood she uses is found in abundance in the Philippines. 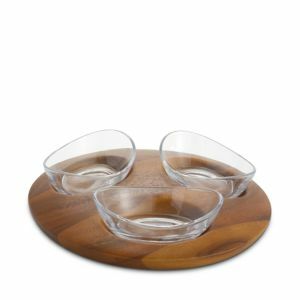 Display your crackers and bread or nuts and candies on these beautifully grained wood serving trays. Hand carved by talented artisans in Kenya. Each piece is made from wild olive wood, known for its striking grain patterns and durability. 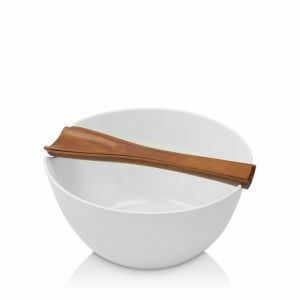 Distinctive grain and dark-to-light coloration add dimension and rustic style to the gently rounded silhouette of this Lucky Brand wood salad bowl. Featuring the gorgeously irregular grain of the teak root, this hand carved bowl is perfect for serving your largest parties and so elegant you'll want to keep it out when your guests go home. Featuring the gorgeously irregular grain of the teak root, this hand carved trough is perfect for serving your largest parties and so elegant you'll want to keep it out when your guests go home. Designed exclusively for terrain, this classic serving board pairs polished mango wood with a panel of crisp, white marble. 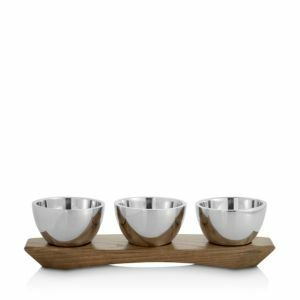 Designed and crafted exclusively for terrain, this polished serving tray is paired with a trio of marble bowls for pairing party snacks and dips. Handcrafted bowl. Art glass. Made in Italy. Handcrafted platter. Fir. Handcrafted lazy Susan. Fir. Innovative mixed material designs for presenting food and drinks. Ideal for everyday use and special occasions. Handcrafted four-piece salad set. Mouth blown glass serving bowl. Ash base, serving spoon, and fork. Handcrafted six-part divided serving dish. Made of mouth blown glass. A contemporary collection combining natural ash, mouth-blown glass, and leather. Ideal for cheese, cakes or pastries. A contemporary collection combining natural ash, mouth-blown glass, and hand-knotted leather. Ideal for cheese, cakes or pastries. A stunning fusion of rustic and cosmopolitan styles, the warm finish of the Olaria Metallic Flared Serve Bowl by Hotel Collection can excite any dining setting with clean design. Featuring a decorated interior inspired by intricate, Moroccan tile work, this porcelain bowl is ideal for serving fresh salads or warming pasta dishes. A stunning fusion of rustic and cosmopolitan styles, the warm finish of the Olaria Metallic Flared Serve Bowl by Hotel Collection can excite any dining setting with clean design. 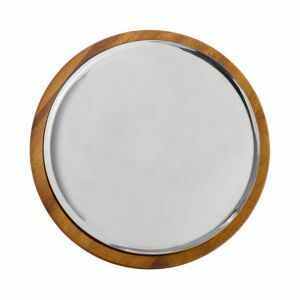 Glazed in an earthy, neutral color palette, this serving platter by Fitz and Floyd is a timeless addition to your hosting repertoire. Featuring a charming vegetable-adorned lid, this tureen by Fitz and Floyd adds a rustic touch to your serving repertoire. Glazed in an earthy, neutral color palette, this serving bowl by Fitz and Floyd is a timeless addition to your hosting repertoire. Serve your favorite snacks, dips, and appetizers in this beautifully handmade vessel. Fashion a look that is bold and metropolitan on your tablescape when entertaining with the crisp tonal banding and speckled glaze of the Olaria Moonstone Serving Bowl by Hotel Collection. Excite your elegant tablescape when entertaining with bold style exemplified by the crisp tones and speckled glaze of the Olaria Moonstone Oval Platter by Hotel Collection. Hand-painted extra-large Talavera serving scalloped edged bowl with handles. Enhance your home and enrich your entertaining with versatile serveware in a beautiful variety of materials from Hotel Collection. Seasoned with multi-tonal speckling, the Hotel Collection Olaria Small Oval Platter elevates entertaining by bringing a fresh take on rustic style to your contemporary tablescape. Put on your paper hat and bring the ice cream parlor home with the Picnic Time Parlor Ice Cream Mixing Set - three ceramic dishes, two stainless steel mixing spades, and a lovely marble slab sit securely in their own cut out sections within a solid bamboo board. A rich wood color updates the clever swivel design of Picnic Time's Acacia Circo cheese board that stores four full-tang tools for serving a variety of cheeses. Invite these ethereal dancers to grace your table setting in a stunningly original way Giraffe-shaped bowl. Nickel-plated cast aluminum. Handcrafted new bone china serving bowl. Part of the Indigo Girl's Range. 12.6"D x 2.6"T. Dishwasher and microwave safe. Elevate your favorite cookies, cakes, and small bites with this elegantly tiered stand. Handcrafted serveware pieces sold individually. Made of mango wood with cast aluminum handles. Food safe. Weathered finish. 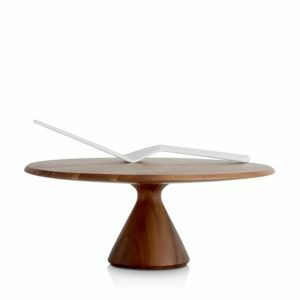 Inspired by the lunar phases of an eclipse, this rotating platter dish + bowl set from DOIY Design brings sleek style to every hang. Small ceramic bowl is perfect for dip and rests on the rotating wooden platter, rendered in contrasting colors with a speckled glaze finish. Serveware set includes tray and three bowls in copper finish. Three-piece set. Copper bowl and aluminum servers. Copper cake plate and server. Base, stainless steel.